Rusedski: "We needed a charismatic character, we need someone with the game, and he showed a lot"
Alexander Zverev has the "mental strength" and "gumption" to come out and win the crowd over after upsetting Novak Djokovic at the ATP Finals in what Greg Rusedski has also described as one the "great performances". 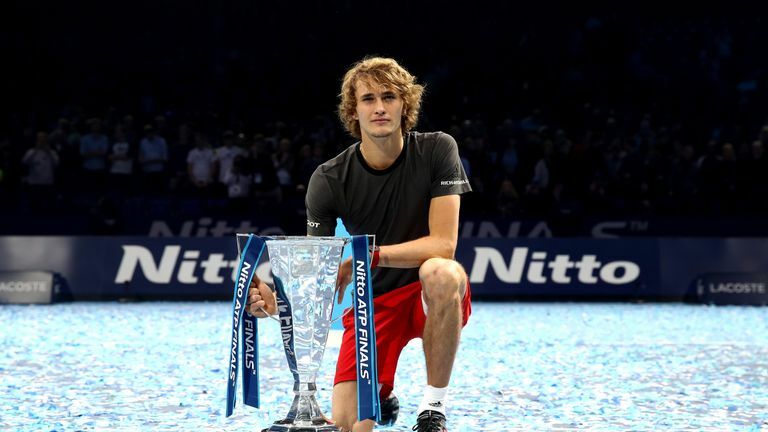 The 21-year-old German has proven himself as the best of tennis' new generation of men's players following his maiden ATP Finals triumph, where he beat Roger Federer and Novak Djokovic in consecutive days to lift the biggest title of his career. Zverev, who was booed by indignant Federer fans after beating their idol 24 hours earlier, saw off the world No 1 6-4 6-3 to the delight of the vast majority at London's O2. "What I'm so excited about is the way Zverev was mentally tough because that really takes a lot of gumption to come out after having the whole crowd against you and win them over," Rusedski told Sky Sports. "We needed a charismatic character, we need someone with the game, and he showed a lot. The other comment he made was 'you guys criticise my forehand' - his forehand was sensational, and his movement, and everything. It was one of the best performances I have ever seen in a final." Djokovic, seeking to win a sixth title, had not dropped a set all week and had swatted aside Zverev in the group stages, losing just five games. But the Serb ran out of steam a little in the capital following an incredible run of form over the last six months. He is still the man to beat for 2019, so I'm not worried about Djokovic. And Rusedski added: "It's been a long year for Djokovic. I think he's played great. He had a little bit of a cold in Paris and had it coming into this event, but he didn't make any excuses for himself. He was beaten by a better player today. "In May we were asking 'is this guy ever going to come back?' He's gone from 22 in the world to No 1 - no player has ever done that before in the history of our game. And he had surgery as well and won two majors, so he'll probably put this to the side and go and learn form this loss, but his 2018 was still fantastic. "He is still the man to beat for 2019, so I'm not worried about Djokovic. I think he'll have no problems sleeping tonight. He'll be disappointed, but upon reflection he'll say 'what an amazing year I've had'."